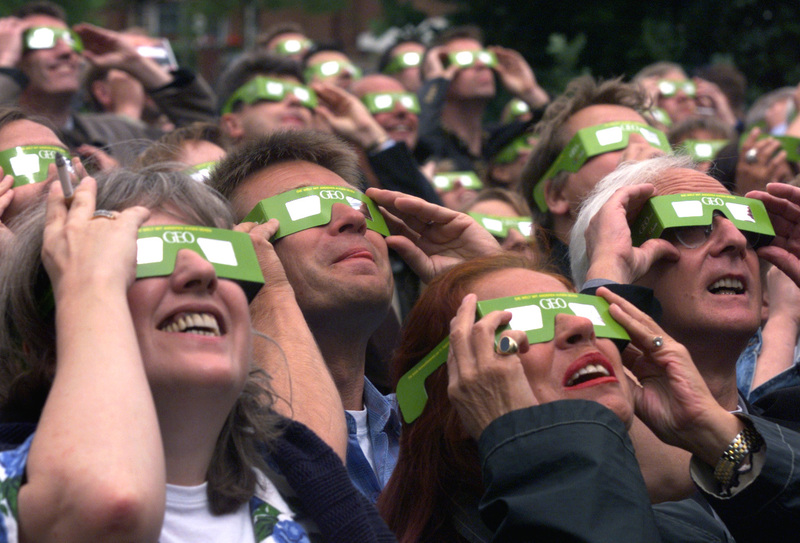 Will a solar eclipse bring Americans together? The stars are as much a part of our lives as the air we breathe or the ground we walk on. We stand on the earth but we look at the sky. Our existence would be impossible and our language, literature and arts poorer, if we were deprived of the moon and stars and sun. No more star-dust memories! The upcoming total solar eclipse on Aug. 21, the Great American Eclipse as it is being called because its path falls across the entire continental United States, is a historic occurrence. Not since June 8, 1918, 99 years ago, has a total solar eclipse extended across the United States alone. Whether because of its rarity or the intense media coverage, the eclipse has captured the attention of Americans in a big way. Lectures on the eclipse are being held at local libraries and observatories; hotels in prime spots for viewing are booked up; hundreds of thousands of people are expected to travel to those areas of the country where a total eclipse can be viewed. I live in a geographic area that lies close to the path of totality, the 70-mile-wide band where from any point of view the moon will totally block the sun. The “path of totality” is a grand-sounding phrase that has itself done much to get me on board for the event. The chance to be a part of something convincingly and completely integral and on target seems as rare as the occasion itself. The chance to be a part of something convincingly and completely integral and on target seems as rare as the occasion itself. St. Joseph, Mo., 45 miles north of me, is squarely on the centerline of the eclipse path and will enjoy two minutes and 38 seconds of total eclipse. Expecting as many as five times its population, the city is taking advantage of an event that is the biggest thing to happen to it since the Pony Express. St. Joseph is so much a cynosure of ecliptic activity that I am avoiding it for that reason. Instead, I am driving 100 miles east to be with family living in the countryside outside Boonville, Mo. In Booneville, too, the eclipse is a big deal. Schools will be closed for the day. Special viewing sites around town are set up for residents and people expected to flood into the city from outside. A three-day Solar Fest is planned. Is it interest in a rare phenomenon that is creating such excitement, or the longing for something that will transport us outside normal, ordinary experience? I suspect for most people it is not simply a view of an astronomical event they are seeking but an experience of wonder and awe—a sense of the ineffable. The spiritual longing that led the Romantics to seek out spectacular vistas in pursuit of the sublime has its counterpart in our own desire to be taken outside of ourselves by what we are told is one of the grandest events star-gazers can have. Is it interest in a rare phenomenon that is creating such excitement, or the longing for something that will transport us outside normal, ordinary experience? The enthusiasm for the eclipse may seem a little crazy, but then nature has long been the other church for many Americans, the church where many worship most easily. Our regard for nature may be the best part of our history and national character. It gave us our national parks, which led to a worldwide national park movement. It gave us the Hudson River School, with artists such as Thomas Cole, Alfred Bierstadt and others painting dramatic landscapes reflecting the belief that nature, and the American wilderness in particular, was a manifestation of God. It gave birth to Transcendentalism, a uniquely American philosophical movement. The Transcendentalists were idealists who believed that divinity pervaded all of nature and humanity. They celebrated both nature and the individual, believing that organized religion and organized political parties were corrupt and corrupting. In our increasingly secular era today where fewer people attend church and disillusionment with political parties is endemic, we are all perhaps more children of the Transcendentalists than we realize. We are two older guys from NY (NY plates) in St. Clair, MO, to see the eclipse. So far the welcome has been mixed. Will be vigilant going forward, as some apparently don't want us here. I won't be in the path of the eclipse but when I imagine myself there, it literally makes me fear and tremble. That in the middle of the daylight, it gets dark as night, is terrifying as it makes me aware how for all the fussing and fighting, all the grandiose and marvelous accomplishments and knowledge, and the busyness of earthly life, we are totally powerless in the grand scheme of the cosmos. At any moment a cosmic event could wipe us out, all of it , forever. These 3 minutes or so of total darkness; waiting for the light, for the cosmos to right itself again so we can go back to what we were about before, is a religious epiphany event. Uniting Americans? What about uniting all humanity in realizing how if not for God and God's love for us all, we and all our doings all are fussing and fighting[ my friends] are helpless and powerless creatures. An eclipse is a humbling authentic "look up, look up, seek your Maker" moment. Bring Americans together? We are a country defined by diversity. Make up your mind. As the president of SLU once said families don't even get along all the time.